On an instrument with a "zero fret", serves to control the string height ...a job normally done by the nut. 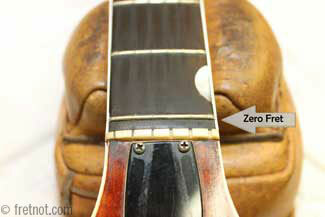 Looking at this Gretsch you can see the first fret is actually a zero fret, with the nut seated very close behind. On instruments with a zero fret the traditional looking nut serves only to space the strings, it is the zero fret which determines their height above the fingerboard. To measure the scale length of an instrument with a zero fret one would measure from the center of the zero fret to the center of the 12th fret and double this measurement. The only difference between this and traditional style guitars is that the position of the zero fret is actually the beginning of the fingerboard's length, not the nut. Technically speaking, when you play a 1st position C chord, for example, some notes of the chord are fretted others are simply open (un-fretted). This means the strings that are fretted rest upon fret wire, the strings that are not fretted are resting against the nut, which is typically made of plastic, bone, ivory, graphite or other material. Theoretically you could argue that this sounds like a very important thing, but in the real world you'll find a variety of opinions. A common issue behind open string buzz is action (string height) that is set too low at the nut. On a traditional instrument the nut would be replaced or shimmed to adjust the height and eliminate the buzz. When adjusting the string height of an instrument equipped with a zero fret the fret wire used as a zero fret would be filed to lower, replaced to raise.